Batteries don’t always receive the consideration from end users that they deserve. They power crucial equipment, including large floor care machines, and allow janitors to work untethered for extended periods of time. 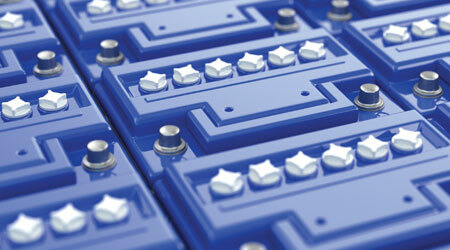 But these days, advancement in battery technology has created a whole host of options for end users. And with battery jargon running wild — sealed, flooded, VRLA, AGM, gel, TPPL — it’s hard for even discerning customers to keep up. To make matters worse, misunderstanding battery types can lead to poor battery maintenance, which is a sure way to shorten the life cycle of a battery. Most of the batteries used in the cleaning industry are lead acid batteries, which come in two types: flooded and sealed. Although much of today’s floor care equipment runs on flooded batteries, which are generally less expensive and have a longer cycle life, the jan/san industry is seeing growing interest in sealed batteries, also known as valve-regulated lead acid (VRLA) batteries. Flooded batteries require the addition of water, whereas sealed batteries do not, thereby making them “maintenance-free” — an attractive feature for some facilities. Wehmeyer tells his customers that a flooded lead acid battery that is well-maintained will always outlast a sealed lead acid battery. But a flooded lead acid battery that is poorly maintained will not last as long as a sealed lead acid battery that doesn’t require maintenance. But maintenance programs aren’t the only consideration when choosing between batteries. Some facilities mandate the use of sealed lead acid batteries for safety reasons. The sealed battery has a one-way valve designed to release any excess pressure if the battery is overcharged. Unlike flooded batteries, a sealed battery will not spill acid when tipped on its side, allowing it to be mounted in different positions.